As part of its new strategy for Motocross racing, Honda has taken the decision to cease the 150 European Championship as it shifts its focus to increasing support of the EMX250 and MX2 championships following the launch of the all-new CRF250R. 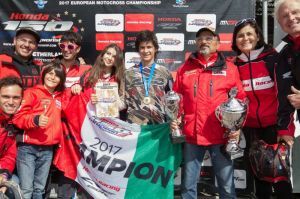 The Honda 150 European Championship has been a resounding success; helping scores of children between the ages of 11-14 from around the world fulfil their dream of becoming a professional racer. The programme began in 2013 and over the years has produced some stunning racing while helping hone the talents of young riders who were all equipped with the Honda CRF150R. This year’s Honda 150 European Championship winner Andrea Adamo is the latest in a long list of distinguished alumni who have gone on to perform well in international competition including Tim Edberg, Jere Haavisto, Viking Lindstrom, Rick Elzinga, Emil Weckman, Hakon Fredrikson, Alberto Forato and Shana van der Vlist. The conclusion of the Honda 150 European Championship after five successful seasons is part of a change in strategy that sees Honda increase its support of the EMX250 and MX2 championships on the back of the introduction of the all-new Honda CRF250R. The increased investment in the 250 class of racing exemplifies Honda’s ongoing commitment to supporting up and coming talent in Motocross. It was amazing to be able to help guide the riders, parents and mechanics throughout the championship seasons and I would like to thank them all for presenting the bikes so well on race day. It was great to see the families show so much love for motocross and also to see the Honda CRF150R perform so well in various conditions in World Championship racing. I remember many emotional moments and sharing both the highs of success and the disappointment of defeat together with the riders. A highlight was seeing the progression of the riders who have competed in the 150 series performing in more senior championships. This year we witnessed a great example of this with former 150 Championship runner up, Alberto Forato, racing for Honda and enjoying success by winning EMX250 races in 2017. I also have great admiration for Shana van der Vlist, having previously raced in the 150 Championship, Shana has finished 8th and 10th in the overall Womens World Motocross Championship rankings in the last 2 years. All this while she is still a teenager. Honda will continue to invest in the future stars of motocross. We will strengthen our support in EMX250 and MX2 and with the all-new 2018 CRF250R – which is designed to offer ultimate performance – we will give our supported teams and riders the best possible chance of success. I would also like to thank all of the Honda 150 Championship sponsors and partners, who provided material and technical support to Honda over the past 5 years, thank you. A special thanks has to go to Gerry Bryce and his Racedays team of staff for all the dedicated hard work over the 5 years, delivering a truly wonderful championship for Honda.